Ultra-Rack Protector Plus is a Heavy-Duty Magnet which Holds Unit Securely In Place-No Hardware Required For Installation. Polyethylene Constructuion Is Maintenance Free-No Painting Or Upkeep Required. 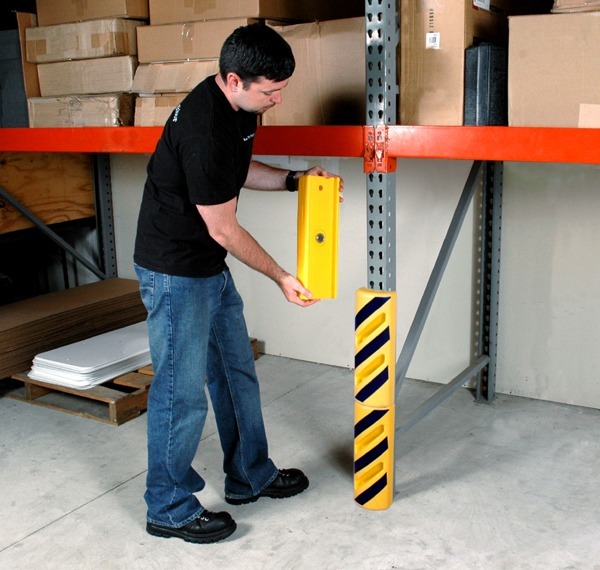 Safety Yellow Color With Contrasting Black Warning Stripes Provides Excellent Visual Reference For Drivers And Other Warehouse Personnel. Stack Multiple Units For Additional Protection. Works With Racking Up To 4″ Wide. Dimensions: 5 3/8″ Wide X 3 1/4″ Depth X 15 1/2″ Heigth; Weight: 1 1/2 Lbs.